It has been an amazing first year with Great War Photos; the site started in January and as we come up to the festive period more than 130,000 people have visited the site in that time. So thank you all for your support, your re-Tweets, your comments and likes on the site. It is very much appreciated. 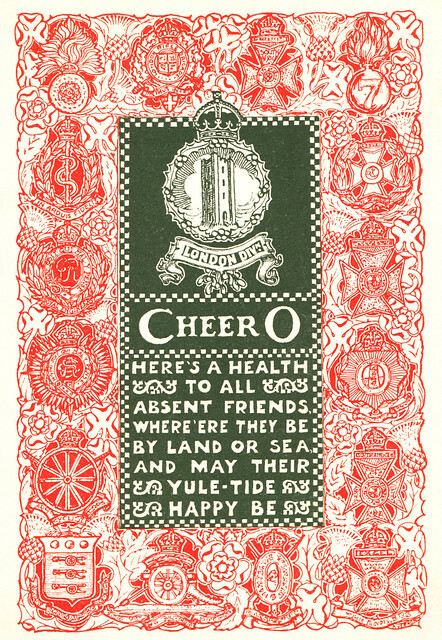 This Christmas Card was sent by a soldier of the 58th (London) Division at Christmas 1917, at the end of their first year of active service which had taken them from Bullecourt to Ypres. It is decorated with the badges of all the different units which made up the division, including the different London Regiment battalions. More Great War Images coming in 2013 – see you all in the New Year! This entry was posted on 21/12/2012 by sommecourt. It was filed under 2014-2018, British Army, Great War, Western Front, WW1 and was tagged with Christmas, London Regiment, WW1.